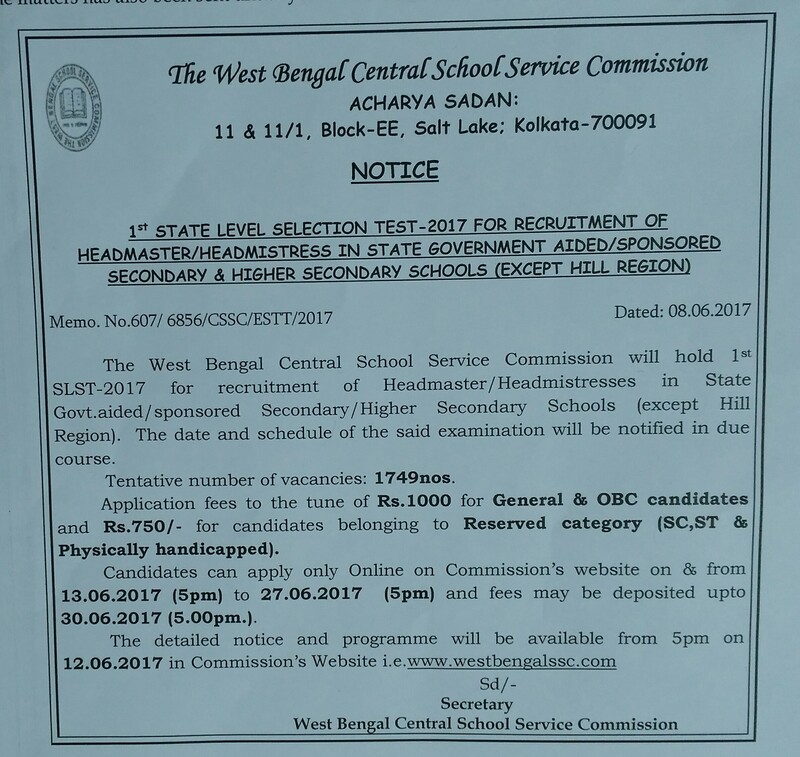 WBCSSC Recruitment 2017 – The West Bengal Central School Service Commission (WBCSSC) invites application for the post of 1749 Headmaster/ Headmistress in Secondary/ Higher Secondary Schools. Apply Online before 27 June 2016. How to Apply WBCSSC Vacancy : Interested candidate may apply Online through the website www.westbengalssc.com from 13.06.2017 to 27.06.2017. The West Bengal Central School Service Commission (WBCSSC) invites application for the post of 2256 Assistant Teachers for Non-Govt. aided/Sponsored Schools in West Bengal. Apply Online before 30 December 2016. Educational Qualification : Graduate from a recognised university with Post Graduate Basic Training or Work Education as a subject in Bachelor of Education in regular course from a Teacher’s Training Institution duly recognised by the National Council for Teacher Education (NCTE). Application Fee : General & OBC candidates have to pay Rs.250 /- and Rs. 80/- for reserved (SC/ST/ PH-VH/PH-HI/PH-OH) candidates through Internet Banking or Debit card or Credit Card, instantly through online OR through printed Bank Challan with Cash at Allahabad Bank branch in West Bengal OR through Sahaj Tathya Mitra Kendra by cash instantly. How to Apply WBCSSC Vacancy : Interested candidate may apply Online through the website www.westbengalssc.com from 19.12.2016 to 30.12.2016.